A message from the University of Tennessee, Knoxville. A “first-in-human” clinical trial being conducted at The University of Tennessee Medical Center may lead to earlier, more accurate diagnosis for patients affected by amyloidosis. The research team in the Amyloidosis and Cancer Theranostics Program at the University of Tennessee Graduate School of Medicine, led by Jonathan Wall, PhD, Director and Professor of Medicine, is collaborating with teams from the Cancer Institute, Department of Radiology and Nuclear Medicine to recruit patients to the trial, perform the imaging studies, and evaluate results. Dr. Wall hopes this technique designed to image amyloid may one day be approved by the FDA and made available to clinicians in order to allow them to confirm, localize and quantify the presence of amyloid in the body. 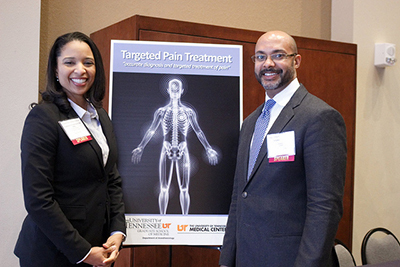 The University of Tennessee Medical Center and the UT Graduate School of Medicine held the first annual Targeted Pain Treatment (TPT) Conference on February 1. The TPT Conference provided up-to-date education on the accurate diagnosis and targeted treatment of chronic pain. On March 15, a group of 12 University of Tennessee Health Science Center College of Medicine fourth-year medical students celebrated a nationwide event known as Match Day in Knoxville. 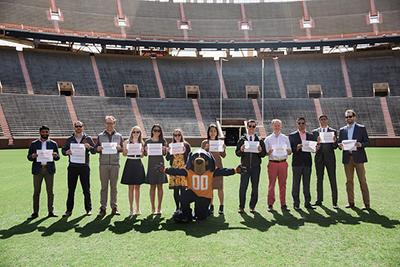 The students, joined by the UT Knoxville mascot “Smokey”, ran from the south end zone of Neyland Stadium to the 50-yard line to receive their Match Day letters. Issued by the National Residency Matching Program, Match Day letters reveal the specialty programs and locations where students will begin their internship and residency training after graduation from medical school. Residency programs begin July 1. 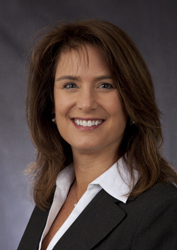 Amy Paganelli, CPA, MBA, has been named the first Chief Operating Officer of the University of Tennessee Graduate School of Medicine. She will assume responsibilities for day-to-day management of operations, in addition to her current portfolio as Assistant Dean, Finance and Administration. Dean Paul J. Hauptman, MD, announced that William Metheny, PhD, and Paige Johnson, MD, have agreed to serve as leaders in the oversight and further development of undergraduate medical education programs at the University of Tennessee Graduate School of Medicine. 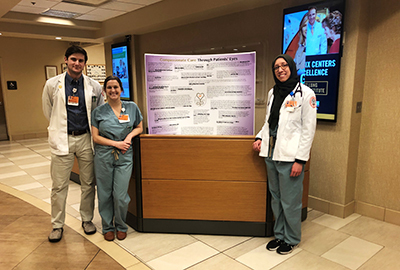 During "Gold and Humanism Honor Society Solidarity Week" February 11-15, medical students at the University of Tennessee Graduate School of Medicine joined students across the UT Health Science Center system and nationwide to highlight the importance of compassionate care. "UT surgeon wants doctors to prescribe fewer opioids after procedures"
"3 best ways to avoid getting sick"
"Doctors seek answers to chronic pain treatment in East Tennessee"
"Leaders at Knoxville's only level trauma center share benefits and challenges of regional system"
The Scope is a newsletter from the University of Tennessee Graduate School of Medicine. The Knoxville campus of the University of Tennessee Health Science Center and the clinical partner of the UT Medical Center.